Rhizomes 1.5-2 × 0.5-1 cm; bulbs 1-1.6 cm. Stems 1/2-2/3 floriferous, 0.7-1.5(-2) m. Leaf blades elliptic to oblanceolate, 20-50 × 3-10 cm, apex acute. Inflorescences 3-6 dm; terminal raceme 1-4 dm; secondary racemes spreading to ascending, 0.6-1.2(-2.2) dm; tertiary racemes rare; bracts lanceolate to subulate, brownish green, 2-6(-9) mm, floccose abaxially, proximally, and marginally. Tepals purplish maroon to chocolate brown adaxially, green abaxially, aging to dark green, obovate-oblanceolate, 5-10 × 1.8-4 mm, base gradually attenuate, not clawed, margins entire, apex obtuse; glands dark purple to nearly black, obcuneate, not nectariferous; stamens 4.5-6.5 mm; filaments adnate to tepal bases, 0.3 mm from ovary base, dilated basally, 1/2 or more as wide as tepals at insertion point; anthers 0.7 mm; ovary conic-ovoid, finely tomentose, becoming glabrate; styles 1.6-4 mm; pedicel spreading to ascending, 2-11 mm. Capsules elliptic-oblong, 18-25 × 10-15 mm, sparsely pubescent. Seeds 8-13 × 4-6 mm (including wings). 2n = 16. Flowering summer. Rich, moist, deciduous forests; 10--800 m; Ark., Fla., Ga., Ill., Ind., Iowa, Ky., Mo., N.C., Ohio, Okla., Tenn. The purplish maroon to chocolate-brown tepals and the tomentose young ovaries are distinguishing characteristics of Melanthium woodii. In parts of Illinois and the Ozark regions of Missouri and Arkansas, this species sometimes is locally common, but often in the leafy sterile condition. Flowering is sporadic and appears to be promoted by fire (J. E. Ebinger 1993). Local throughout the area indicated on the map. Where it is found, however, it is usually frequent over a small area. It is usually found in rich soil on the south sides of deep ravines, although I found a single specimen in a crevice of a limestone cliff along the Muscatatuck River about a mile above Vernon, Jennings County. This species interested me years before I knew what it was. I had seen the large root leaves and watched to see the plant flower but could never find one. I transplanted one to our garden and it was several years before it bloomed. I have not kept a record but I estimate that it flowers about every 4 or 5 years. 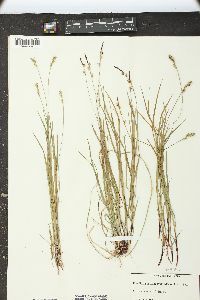 This plant, during the 15 or more years that it has been under observation, has increased to only two plants. The flowers are deep maroon, or some of them almost black. One specimen in particular was observed. The inflorescence was 23 inches long and three and a half inches wide. The first flowers expanded the last of July and insects continued to visit the inflorescence until in September. Harry Dietz, a visiting entomologist, observed within five minutes 2 species of Anthomyids, 4 species of Muscids, 1 species of Ortalid, 2 species of Phorids, and 1 species of Syrphid on one plant. It has been reported also from Cass, Greene, Hamilton, Monroe, Putnam, Tippecanoe, and Vigo Counties.